Hawkeye Apples from my brothers Tree. As we start farming and planting on our own farm, I am always looking for plants and animals that we like and want to grow. Last year my brother Smokie bought an older home in Iowa and it has this apple tree that has some very tasty apples. As a matter of fact they were some of the best tasting apples I have ever eaten and I wanted to start growing this variety myself and would research what variety it was so I could buy my own trees. Now I knew by the looks of this standard sized tree that it is very old and was going to be an heirloom variety. My brother Smokie’s Hawkeye apple tree. Like I said, I could tell that it was very old, but didn’t know how old. The house where this tree is at was built in 1889 and is one of the oldest homes in The area. There are a few sites that you can check out to see pictures of apples and describes all the characteristics of the tree and and apple, so I started my research. I thought at first it might be a Wolf River apple tree, which was discovered by Wolf River Wisconsin in the 1800’s, but wasn’t sure then I came across a picture of a Hawkeye apple and found that this tree and the apples had all the charteristics of the Hawkeye apple tree and I said that must be it. So I started digging into the hawkeye and found it has a very distinguished and interesting history. One of the characteristics of the Hawkeye apple are 5 bumps on the bottom. It all started in 1880 in Madison county Iowa by the town of Peru on the farm of Jesse Hiatt. It was a chance seedling that was growing in Jesse’s apple orchard but was growing not in one of his straight rows but between the rows. So Jesse liking his trees being in straight rows and orderly mowed it down, but the little tree sprouted again and Jessie mowed it down a second time. That would have done in most trees but not this one, it started sprouting again and the legend goes Jesse seeing this and being a Quaker said “if thee must live, then thee may” and Mr. Hiatt nurtured the tree and after 10 years the tree prouduced one apple that hung on the tree long enough for it to ripean. When he bit into the red and yellow streaked apple he knew he had something special and was very impressed with the sweet firm juicy flesh and told his wife “Ma, this is the best tasting apple in the whole world.” He named the apple Hawkeye after his adopted state. Giving some of my apple trees a fresh layer of wood chips. Mr Hiatt tried to sell his tree to 8 or 10 nurseries but all thought the apple looked odd with its 5 bumps on the bottom and with the odd shape didn’t think it would sell and found no takers for his trees, then his big break came. In 1893 Stark Brothers Nursery in Missouri was looking for a new and better tasting apple then the Ben Davis which was the biggest seller in 1893. The Ben Davis looked good and stored well, but didn’t taste all that great, so Stark Brothers was looking for better tasting apple. They held a nation wide contest and encouraged all orchards to send in their best apples. When Clerance M Starks President of Stark Brothers Nursery, bit into Jesse’s apple he said “My this is delicious” and declared Jesse’s apple the winner. Stark Brothers bought the rights of this tree and named it delicious, so the biggest selling apple of all time, the Red Delicious came from the state of Iowa. The current red delicious taste nothing like the original Hawkeye apple with the hawkeye tasting much better. It was changed to be much redder and to store longer through the years, much like the Ben Davis like what they wanted to replace. The state of Iowa used to be #2 in the country in apple production until Armistice day 1940 when a blizzard destroyed many apple trees and Iowa’s apple production never recovered. Mr Hiatt’s original tree was split in half during the Armistice day blizzard, but did later sprout two twigs that they let grow into new trees. Here is the interesting part to me. You can’t grow a apple tree from seed and expect the apple tree to be just like it’s parent because that can be influenced by other apple and crab apple trees near by that would pollinate the tree. The only way you can get the exact same tree and apples is by grafting. This is how Stark Brothers nursery produced new trees was by taking cuttings from the original tree and grafting onto different rootstock. I believe that my brothers tree was grown from wood from this original tree because of its age. 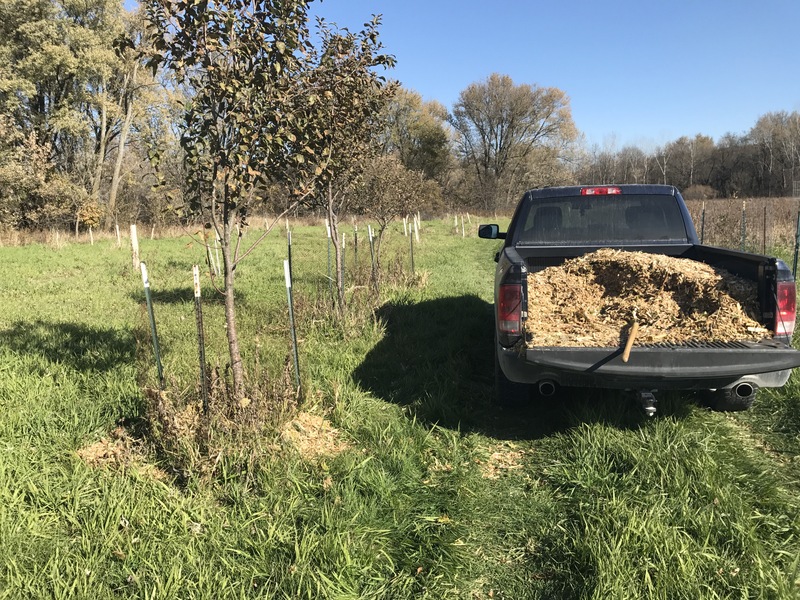 last March my wife and I took a grafting class in Decora Iowa at the Seed Saver Exchange and I plan to graft wood from my brothers tree to some rootstock I already have. I am excited to get started and will let you know how it goes. 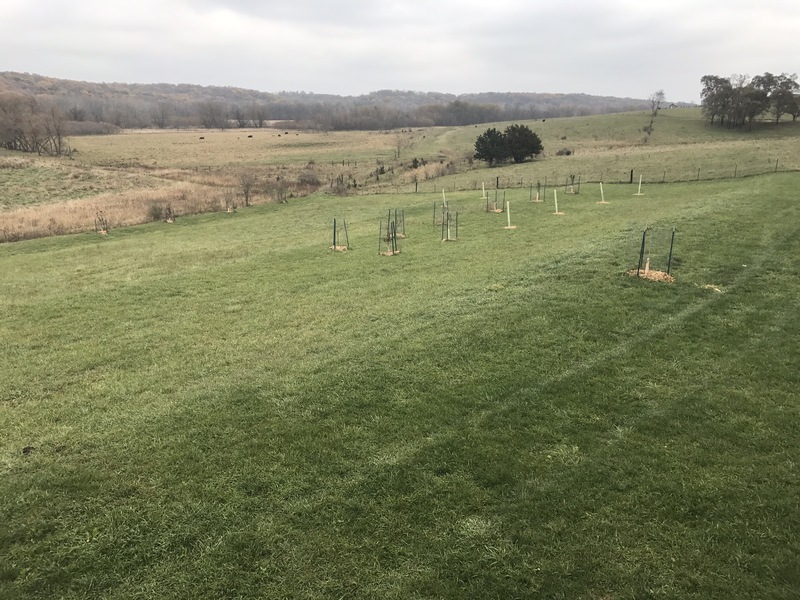 I am in the beginning stages of starting our own orchard and have planted Over 25 different fruit trees this past year. Some of our apple trees on our bottom ground. Some of the fruit trees we planted this year. This entry was posted in Tree tubes. Bookmark the permalink. Good luck with your grafting project. Thanks Matthew, hope your new business partners are working out for you too. 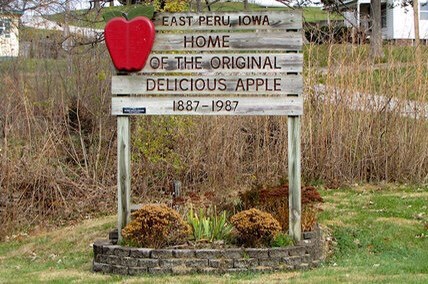 Excellent history lesson about the Iowa apple and how it became the delicios apple. I always learn do much about so many things from your post. Please keep them coming. Thanks Varnetta, glad you liked it. Looking forward to seeing all soon. So cool and interesting. I finally got a deer here in Mo. I took a eight pointer with my crossbow a day before gun season. I now have 50 lbs. of venison in my freezer. Keep up the good work. Good for you Rick, that’s some good eating. You need one more. Fascinating History of one variety of Apple there Gordon. I studied Fruit Trees at College, & one interesting fact I learned (or as my Wife would say “Useless information”, lol) , was that the Bramley Cooking Apple needs two other Apple Trees, of different varieties in the vicinity to pollinate it. At the same time, because a Bramley’s own pollen is infertile / sterile, it can’t, in turn, pollinate other Apple trees. 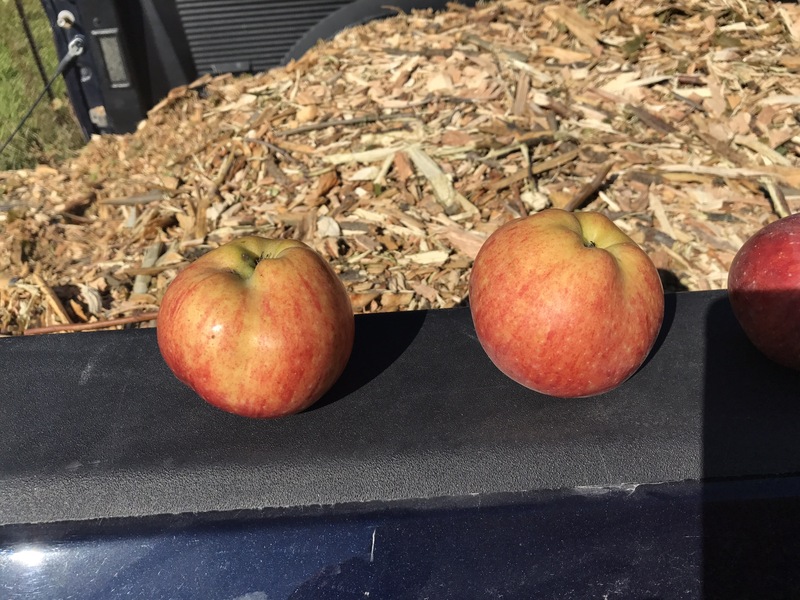 Thanks Steve for your comment, that type of apple tree is called a Triploid and you are right it needs two other varieties that bloom around the same time for it to be pollinated and it is sterile and can’t help pollinate other varieties. It’s only worthless information if you don’t plan to grow apple trees, other wise you need to know this stuff. Thanks for sharing that. Okay, okay. You can plant more trees. Thanks for your blessing dear. We are in Northwest Montana. I’ve been planting apples for a while. It’s been a challenge between deer and voles but I doubled down a bit this year. I feel that we need large trees unless I build a very high fence so this year I bought Antonovka root stock. I have a few on that rootstock already (Red Gravenstein, Belmac, William’s Pride, Pristine and Liberty). And if I leave one as is it will make a decent apple tree as well. So I spent very little for the rootstock and it can get well established before I graft onto it. It sounds good Cathleen, I have some of the same problems here. 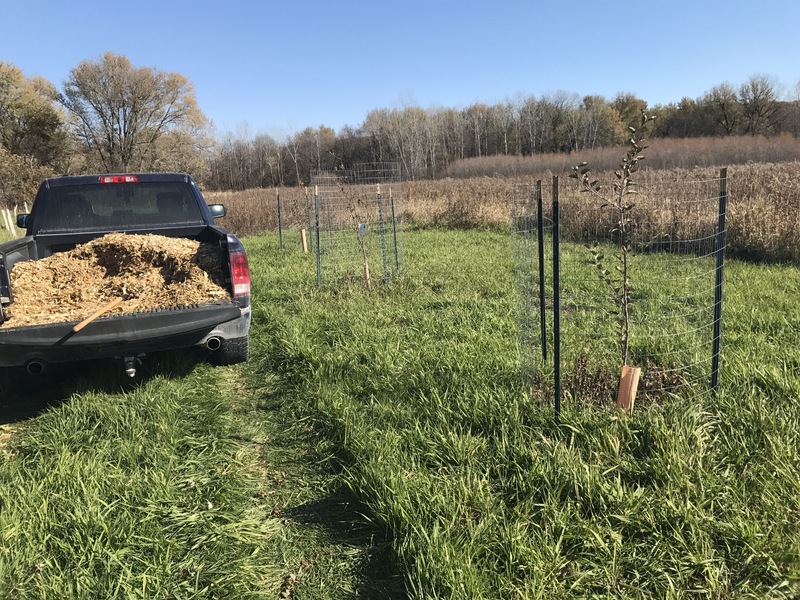 I use 4ft tall true tubes and once the tree emerges out the top of the tree tube I put a 5ft tall fence around each tree.